What better way to celebrate our family's national holiday, Black Friday than shopping with us! If you're planning on shopping at Amazon, do it through our link below. It will keep our kids cute. I swear! We'll be able to keep them fed and clothed and it won't really make a difference to you if you're shopping there anyway. The latest photo album is up for your viewing pleasure. Things are going pretty well in the Black Haus. Lyla informed me the other night, "You're the best daddy I ever had. I'm gonna love you forever. You're my hero." Lyla now has a pony, ice cream for dinner every night and a gold tea set for her dolls. Aside from that, she's been loving pre-school and is coming home with all kinds of new information and stories to tell us. It's kind of odd that she has a life without either of her parents around. Quinn has gotten pretty good about pulling himself up on tables, drawers, cabinets, etc. and can now get himself back to sitting, too. He still isn't walking, though. We're not sure if he still hasn't developed the leg strength for it, he's too scared to try or he's just plain lazy. Hopefully he'll get walking soon, but for now, he's crawling like a demon and opening up and emptying every cabinet he can. He hasn't done much in the way of talking either. The most he'll say is "hi" and "mumma". However, he LOVES music. He'll sway back and forth to the beat as soon as he hears any music and he plays the instruments in his music class with total glee. 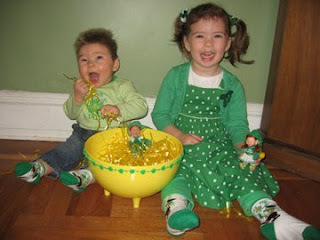 Lyla and Quinn got their Pot of Gold from their leprechauns for St. Patty's Day. Much love from the Black family! As of our last trip to the doctor on 1/20, Quinn weighed 17lbs 11oz and measured 27 1/2". Lyla was 36.9lbs and 38 3/4". Quinn has been starting to roll from his back to his belly a bit more than he was before. He rolls just fine from his belly to his back. He actually has been hanging out on his side quite a bit. In addition to pureed baby foods, he's starting to eat finger foods, though he doesn't get them from the tray to his mouth on his own so well. He tries to take every food that Erin and I are eating, though. It doesn't matter what it is, he'll put his hand out for it, even dragging our dinner plates toward him and shoving his hand into whatever is on the plate... like ketchup. 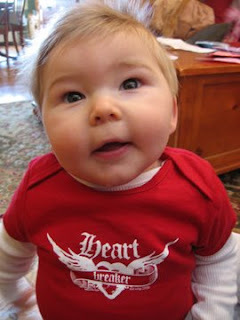 Lyla has been cracking us up on a regular basis. She definitely has a mind of her own and loves singing songs, dancing, drawing pictures, painting and making up stories. Best of all, Lyla regularly uses the potty! It seems the key to training was telling her she wouldn't be able to go to school until she was potty trained. It's pretty clear we are raising a nerd. We needed to pretty quickly add that she also needs to be three years old and she can't start until the fall session, but she didn't seem to mind that so much. We also got to check out her future preschool on a visiting day and it seems like she'll be very happy there come September. January brought a lot of family birthdays, including Grandpa, Mima, Bubbe, Aunt Bevy and, of course, ME! Lyla loved singing Happy Birthday as much as she could. On my birthday, Erin and the kids brought me breakfast in bed, which was an unexpected and fantastic treat. The holidays were a bit hectic and exhausting. Thanksgiving had its ups and downs. We left for Massachusetts the Sunday before Thanksgiving and I worked out of a subsidiary of Scholastic Media in Watertown for the first few days of the week. What seemed like a great plan to have a more relaxed visit with less travel stress and more time with Mima became a bit stressful as Quinn decided he didn't like being away from home and would cry all night long, no matter where he was in the house and who was with him. Top that off with Mima being sick all week and it was a tricky week to get through. The day after Thanksgiving we were able to visit with some of my old friends at a USY (Jewish youth group) reunion at my former temple. It was great to see people I hadn't seen in ages and all of their kids. In December, Lyla and I made a special trip to the Dora and Diego exhibit at the Children's Museum of Manhattan. It was Lyla's second time there and my first. Lyla and her friends Lily and Zoe (and their respective mom's) went to Macy's to check out the store's winter wonderland. 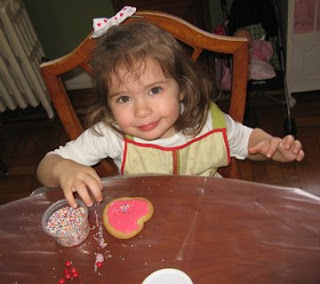 Back in Astoria, we all had a great time at Lily's house for the moms' holiday party. Then we headed out to Oshkosh for Christmas and brought our menorah with us, as the first 7 nights of Hannukah were during our trip. Unfortunately, Quinn also brought his aversion to sleeping anywhere away from home which made for some sleepless nights for either Erin or me each night. On the positive side, Lyla and Quinn had a great time playing with Keira and Will and getting lots of love from Grandma Jane and Grandpa all week. Lyla got to build snow forts and snow men in the deep Wisconsin snow. We also got to visit with lots of Erin's friends, which is always a lot of fun. Then the girls got down on the dance floor at Kelly Hoxtell's wedding. Back in Astoria, we spent New Year's in Astoria at Zoe's (and her parents) house. The kids actually made it to about 11:00pm, but we had to leave at that point and they were asleep by the time the new year rolled in.